All about Google: Google Adsense incorporating printing media. Google Adsense incorporating printing media. The Google adsense program has been highly sucessful as a means of displaying ad information on the web without disrupting viewer. Google has accomplished this largely by its search engine capacity to analyse a web page and discover the main topics it covers. This mechanism implemented by Adsense has made Google a billiionare company, with more than $4 billion just in the first quarters of 2005. Now, Google is not only improving adsense, but also extending it to other medias as well. Proof of this is the Adsense ads that are now being displayed on traditional newspapers. 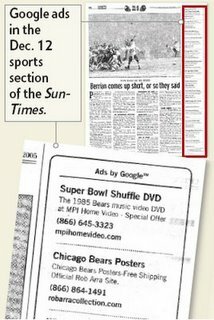 The picture bellow, from Rossin's blog, shows how adsense ads are displayed on the Sun-Times. in the Sun-Times, Google is running ads in proximity to relevant content. On Dec. 12, for instance, Google ads touting ticket brokers, White Sox apparel and Chicago Bears memorabilia ran in the Sports section.